I get into the office around 6:30 each morning. I find I can get a lot done early, before my staff arrives, the phones start ringing and before the start of endless knocks on my office door. By nine or so, I’m ready for a break and sometimes, if I have a roll of film that needs developing, I’ll slip down the street to the little camera store near me. They open at 9:30. One day last week, I had two rolls to develop and scan, so I slipped through the Starbucks drive-thru, got a hot cup and popped into the photo shop. As I was being waited on, I couldn’t help but overhear a conversation going on over at the used camera counter about which was the best film camera for a newbie analog shooter. 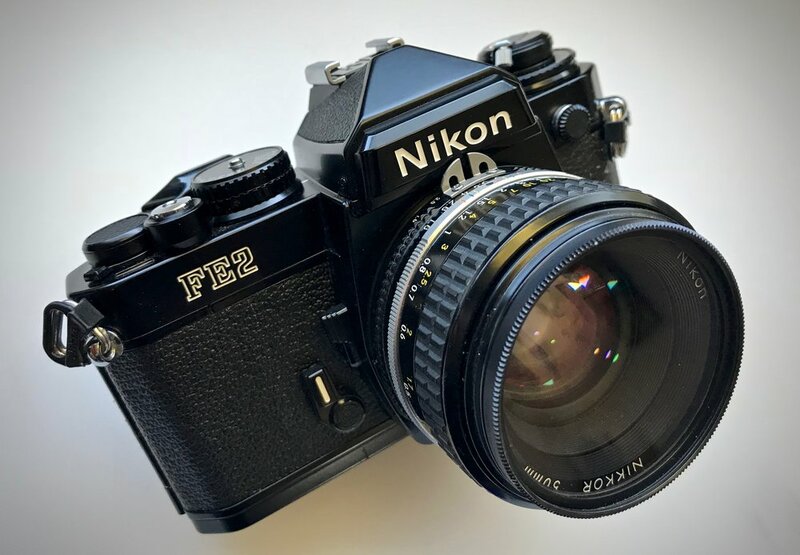 A young man from the junior college was on a mission to get a 35mm film camera for his photography class and he was asking questions as he held a Nikon FG to his eye. One of the clerks motioned for me to come over… “this guy has like a hundred film cameras, let’s see what he says.” For the record, I don’t have a hundred cameras, but I’m always happy to join a conversation about film photography. And I had a nice cup of coffee to sip on. A lively discussion began. Almost all of the folks who work at this particular store are over 50 and while they’ve all moved on to digital photography, most had shot their share of analog cameras. Since it was early in the semester, the used camera case was fairly well stocked with a variety of affordable film cameras. Everyone had an opinion or two…or three about the best starter camera. I found out a few days later that the student did buy a camera that day and I’ll tell you which one at the end of this post, but as a service to anyone in the same situation, here are the notes from our coffee conversation, best I can recall. 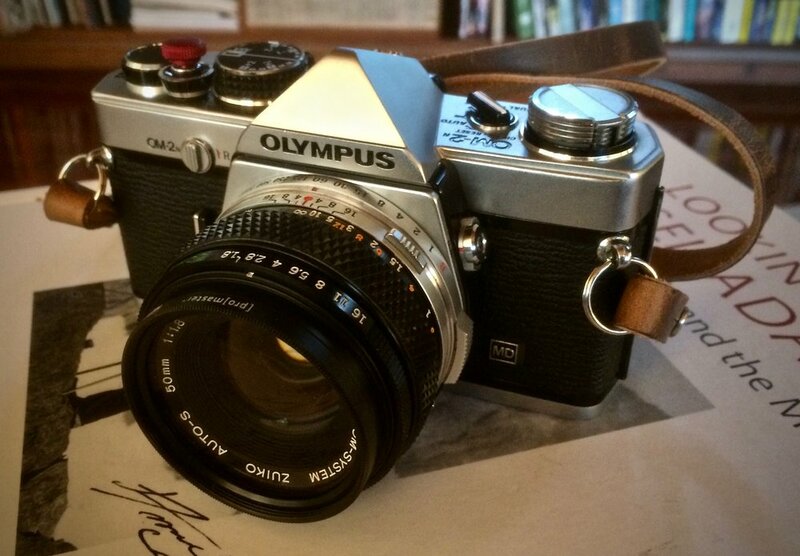 Everyone was fond of the OM-1/OM-1n and OM-2/OM-2n SLRs from Olympus. The OM-1 bodies are getting pretty old and they need a battery conversion to work with modern power sources unless you want to carry a light meter. If you can find a converted and CLAd OM-1, it wins. If not, the OM-2n is the Maitani masterpiece to get. Also worth mentioning that the kitted Zuiko 50/1.8 was the winner in the Olympus glass part of the discussion. My Canon experience isn’t very deep, so I could only offer up the original F-1, F-1n and A-1 as my suggestions. The TLb was brought up as being a good, simple picture-taker and you can’t have a Canon film camera conversation without the the AE-1 coming up at least once. In the EOS line, it was recommended to stay with the single digit pro bodies if possible. I have not shot any of the EOS film cameras, so I couldn’t weigh in here. I love my Canon F-1n. It’s never been serviced, the meter is spot on, it’s beautiful to look at and those Canon FD lenses are inexpensive and amazing! And my Canon A-1 is a very competent picture taker once you get used to its controls. Here is where the conversation got interesting. Nikon’s line of truly great film cameras runs pretty darn deep and availability is always good. Everyone was in agreement that the Nikon FM, FM2 and FM2n were pretty good choices for a fully manual SLR to really learn on and grow into. The FE and FE2 were close seconds and at just $30 without lens, the FG that the student had in hand wasn’t a bad choice either, although I’ve heard that the build quality of the FG isn’t up to par with many of the other F series cameras, but I don’t know that for a fact. And all of these cameras are easily and affordably serviced at a number of places if needed. The Nikkormat/Nikomat and Nikon EM cameras are pretty old, but many of them are still taking beautiful photos today, so if you can find a good one from a dependable source, they might be an option too. Nikon’s pro bodies are hard to beat and they are still affordable (although that might change given the resurgence of film photography). The original F is wonderful to shoot, but these are 50 plus year old cameras so finding one that doesn’t need at least a minor CLA is getting more and more difficult. I’ve owned two and the meters were dead in both. They had black body F in the used case that day with a working but finicky meter. The F2 is probably my favorite camera of all time. It’s an assembled-by-hand, metal and glass masterpiece that uses modern batteries. Every analog photographer should shoot an F2 at least once. And even though the F2 was built to handle extremes, every one I have ever owned required—or at least deserved a CLA. In the F2 line, the F2A or F2AS are probably the ones to look for if only for lens compatibility. The Nikon F3 is an incredible camera and there was one in the case for $169. Nikon sold the F3 for like 20 straight years! It’s hard to imagine a digital camera today staying in production for 20 years! That says volumes about the F3. The student was seriously considering the F3. I’m particularly fond of the Nikon F4 for sentimental reasons and love mine, but it’s probably too big, too heavy and too complex for someone just starting out in film photography. Same with the F5. And the F6 is just way too expensive. Some other more modern Nikons to recommend: the N90s and F100. The N90s was a 1990s marvel and the F100 was nearly the last film Nikon. Both are good choices if you want an auto-focus body. I told the group that I enjoyed shooting my F100 on my recent vacation. Pentax often gets overlooked in favor of Nikon and Canon. I have to admit that I did the same for many years until I tried a Pentax ME Super. 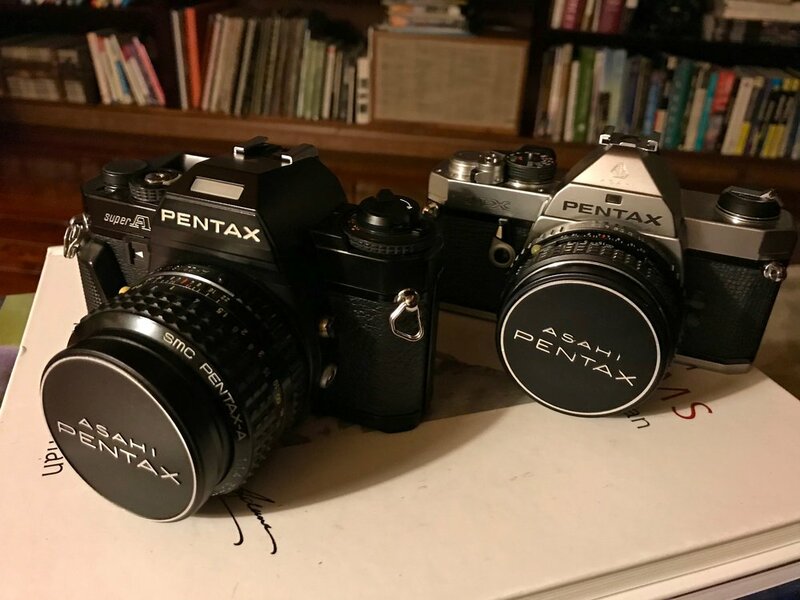 There are a wide variety of Pentax cameras to choose from, but you have to make the choice up front between two lens mounts; the M42 screw mount or the K bayonet mount. M42 is the earlier Pentax mount. At the time, it was also called the “universal” mount, so there is a wide variety of Pentax and aftermarket lenses available in this mount. The Pentax-made lenses are called Takumars and they are just amazing lenses! AMAZING! M42 Takumar lenses mount to the Pentax Spotmatic series which includes the Spotmatic SP, SPII, 500, 1000 SPF, ES and ESII. Most of the early Spotmatic cameras require “stop down” metering, which means in order to take a light meter reading through the lens, you must manually stop down the lens to its taking aperture. It’s one extra step in the picture taking process, sounds harder than it is and, with practice, become second nature. Almost all of us around the counter that morning had owned or at least used a Spotmatic. I was the only one STILL using one. I love my Spotmatics and I think stop down metering is a great way to learn more about photography. You can buy a Spotmatic for around $30 and Eric Hendrickson in Knoxville, TN can make it like new. Move over to the Pentax K mount and you can select the KX, KM, K2 or the all time favorite student camera—the Pentax K1000. The camera store guys would’ve recommended a K1000 right out of the gate that day if they had one in the case. The K1000 is a great starter camera—simple and straightforward. That’s why the minute one arrives in the shop, it’s quickly snapped up. Pentax kept the K mount when they introduced a new line of smaller SLRs—the M series. Designed to go head to head with the Olympus OM, there are a number of Pentax M bodies including the MV, MX, ME, ME Super, Super Program and Super A. Any of these M cameras would be a great starter and could be the only film camera you’ll ever need. Top of the line camera body in the K mount is the LX, which some call the best SLR ever made by anyone—but that’s a whole other coffee discussion! Almost every one of the SMC Pentax K mount lenses for these cameras are fabulous and best of all, affordable! There were two ME Super cameras in the case that day with the popular and awesome 50mm f/1.7 lenses attached. Only two of us around the photo counter that day had experience with Minolta and both of us with one of the XD series SLRS (XD, XD-s, XD-7, XD-11). In my experience, if you can find a good one, any of the XD cameras are good and Minolta’s lenses can hold their own against most any other brand. The X-700 and X-570 are also good choices. I like my XE-7. It was designed and built during a time when Minolta and Leica were all cuddly. It has one of the nicest sounding shutters of any camera I’ve ever used, but I know when it dies it’s dead for good because I cannot find a single person anywhere who will CLA it. That’s a shame. 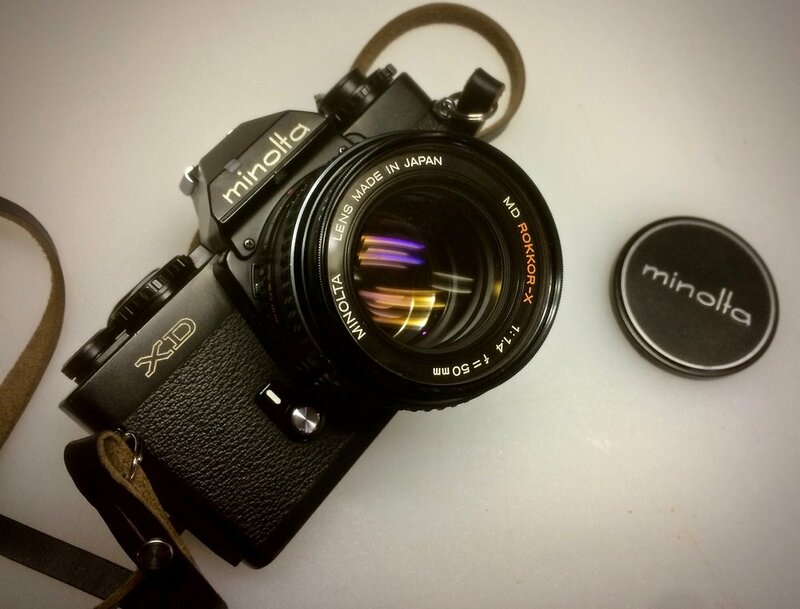 Some people swear by their SRT series Minoltas. I’ve never shot one. The auto focus Maxxum cameras were also mentioned. The junior college film student, I later found out, left the camera store that day to think about it and came back to make his selection. He chose a Nikon FE and kitted it out with a 50mm f/1.8 Nikkor manual focus Ais lens. I think he made an excellent choice. I had seen that particular camera in the case a few days before. It was a nice, black body version like the one in the old ad below. The FE will allow him learn photography by shooting in full manual mode with the added benefit of aperture-priority automation when he wants to lighten his workload. Nikon’s center-weighted metering in this camera is bullet-proof. The 50/1.8 lens, in all of its variations, has historically been a great performer. I’m really not certain if we influenced this young man or confused him, but he walked away with a great camera and we all enjoyed the conversation. What camera would you have recommended he get?